Proteins are the macromolecules having very high relative molecular masses. The building units of proteins are termed as amino acids. The majority of proteins is from a few 20 common amino acids, linked up through peptide (amide) bonds in a particular sequence characteristic of the specific protein. Amino acids are the amino substituted acids having both amino (-NH2) and carbonyl (-COOH) group(s). These are the building units of proteins. The IUPAC names of amino acids are acquired by pointing out the position of amino group via Arabic numeral on the alkyl radical chain of the alkanoic acid, making the carboxylic carbon the number 1 carbon. CH3CH(NH2)COOH α-Aminopropionic acid or 2-Aminopropanoic acid (Alanine). C6H5CH2CH(NH2)COOH α-Amino-β-phenyl propanoic acid (Phenyl Alanine). The α-amino acids are the most significant of all as they are the final products of the hydrolysis of peptides and proteins. The majority of amino acids obtained in nature are α-amino acids. They are termed as essential amino acids as they are necessary in the diet and their absence in human body retards the growth and might even cause death. Because of the complexity of their systematic names, shorter names are in general use. The entire amino acids obtained through acid or enzymatic hydrolysis of proteins are optically active apart from glycine, as each one of them encompass Chiral centre that is absent in the glycine. Naturally occurring amino acid has been illustrated via stereo-chemical studies to have the similar configuration concerning the α-carbon atom and they looks like L(-)-glyceraldehyde. a) Amination of α-halogenated acids: The α-chloro or bromo substituted acid is treated by concentrated ammonia to provide α-amino acid. b) From Aldehydic and ketonic acids: Whenever the acid is treated by hydroxylamine and the resultant oxime reduced through aluminium amalgam, it provides α-amino acid. 1) Amino acids are crystalline solids having fairly high densities and melting points. 2) They are soluble in polar solvents such as water. 3) They are insoluble in the non-polar solvents such as petroleum alcohol, ether and benzene. 4) They all take place in optically active forms apart from glycine. 5) The dipole moments for amino acids are very high. 6) They act as if they are neither acidic nor basic. These particulars point towards their dipolar ion or zwitter ion structure. In solution, this zwitter ion is in equilibrium having a little of the covalent form. If an acid is added to the solution of the amino acid the zwitter ion (A) is transformed to the cation B as the stronger acid form a proton available to the carboxylate and a cation results. Though, if a strong base is added to the amino acid, the zwitter ion (A) is transformed to anion C, as the strong base OH takes away a proton from the ammonium ion making an anion. Therefore in strongly acid medium the amino acids will migrate in the direction of cathode in an electric field and in the presence of a strong base they will migrate towards the anode. This is precisely what happens to the amino acids in an electric field and therefore it further confirms the zwitter ion structure of the amino acids. This is possible that at a specific pH, the concentration of cation B might be precisely equivalent to the concentration of anion C and therefore at that pH there will be no resulting migration of amino acid in an electric field. Such a pH at which an amino acid doesn't migrate in an electric field is the 'Isoelectric point' (pI) of that amino acid. At such point, the concentration of zwitter ion is highest. The isoelectric point is an individual features of an amino acid and based on the basicity of the amino group and the acidity of the carboxyl group that varies by the nature of alkyl group,-R. Therefore pI is 6.0 for glycine, 5.5 for phenyl Alanine and 3.2 for the glutamic acid. The amino acid generally describes its lowest solubility in a solution at the isoelectric point, as at this point, there is highest concentration of the dipolar ion. This knowledge is of huge value in the separation of an amino acid from the mixture. The amino acid can act as a base or an acid based on the pH of the solution. They exhibit the reaction of both the amino and the carbonyl group. i) They make salt with strong acids. iii) Whenever treated with dioxonitrate (III) acid, HNO2 (nitrous acid), they make α-hydroxy acids. iv) If treated by chloroform and alcoholic solution of potassium hydroxide, they give carbylamines reaction. v) If surplus amount of methanal is added, the basic function of amino is blocked. Though the reaction is more complicated, the main product is the dimethylol derivative of the acid. As the product formed consists of a free carboxyl group, it can be titrated by using standard alkali and phenolphthalein indicator. This forms the base of formal titration method. vi) If heated with hydrogen iodide, the amino group is knocked off from the molecule resultant in a carboxylic acid. vii) If treated by nitrosyl chloride, nitrogen is given out by the formation of chloro acid. viii) Trialkyl derivatives of amino acids are generally obtained through heating amino acid with alkyl halides in the methanolic solution. ii) If treated by PCl5, it results in the hydrochloride of acid chloride. iii) If heated with alcohol in the presence of dry hydrogen chloride, the amino acids make ester hydrochlorides. The free acid is obtained if the ester is hydrolyzed via sodium trioxocarbonate(IV) solution. iv) The amino acid is decarboxylated if dry distilled or boiled by barium hydroxide. v) They are reduced via lithiumtetrahydridoaluminate (III) to alcohol. i) They form chelate compounds by heavy metal salts. For illustration if copper(II) oxide is heated with water solution of glycine, a chelate complex in the form of deep blue needles is obtained. ii) If amino acids are heated, they lost two molecules of water among the two molecules of acids to form diketopiperazines, cyclic diamides. 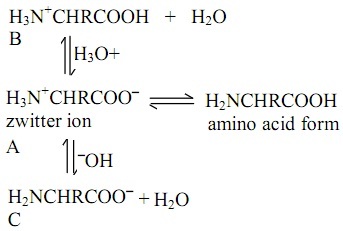 iii) Whenever heated, β-amino acid lose a molecule of ammonia to give α, β-unsaturated acid. iv) Whenever heated γ- and δ- amino acids lose a molecule of water via reaction between -NH2 and -COOH group of similar molecule to provide cyclic amides known as lactums. v) Ninhydrin test: Amino acids react by ninhydrin (indane-1, 2, 3-trione hydrate) to make a colored product. 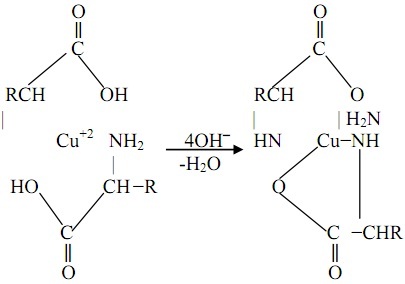 The α-amino acids achieved from the hydrolysis of proteins contained an amino and a carboxyl group. They are linked via an amide linkage. The chains of amino acid residues, linked via amide linkage made by the interaction of -COOH group of one and -NH2 group of the other, by removal of water, are termed as peptides and the linkage (-CO.NH-) as the peptide linkage. If two molecules of amino acids combine in this manner, the product is dipeptide. Three or more molecules of similar or different acids will yield a tripeptide or polypeptide. Whenever the molecular weight is less than 10,000 it is termed to as polypeptide however beyond this it is known as a protein. The -NH2 group end of the peptide chain is known as the N-terminal and -COOH group end is known as the C-terminal. In writing, the series of amino acids in a peptide chain the convention is to start with N-terminal amino acid residue on the left and write the peptide as acylated derivative of the C-terminal amino acid on the right. Proteins are the most significant chemical substances which are necessary for the growth and maintenance of life. They make a necessary part of animal diet. The animal can't live for long without protein diet although it can without carbohydrates and fats. Proteins occur in the protoplasm of all the animal and plant cells. They comprise almost three fourth of the dry material of most living systems. Plants build up their protein by using carbon (IV) oxide, nitrates, water and ammonium salts in the presence of energy obtained from the sun, animals and human beings take plant and animal protein in their food that are hydrolyzed to amino acids in the system through enzymes. Protein is resynthesized in the animal and human system from such amino acids. They are essential for the growth of animal body and as well for replacing proteins lost in the method of living. Some significant sources of proteins and percentage of proteins in them via weight are illustrated in the table below. Proteins are the complex nitrogenous organic compounds having carbon, hydrogen, oxygen, sulphur and phosphorus besides nitrogen. A few proteins include halogens and metals as well. The composition of a protein differs according to the source however an approximation can be as: Carbon 50-55 percent; nitrogen 15-17 per cent; hydrogen 6-7.5 per cent; oxygen 21-24 percent; sulphur 0.2-2.2 per cent and phosphorous 0.1-1 percent. Proteins are prepared from α-amino acids units. A protein molecule might encompass hundreds or thousands of amino acids. There are 23 α-amino acids that by different however precise modes of linking might form an exceptionally large number of different protein molecules. Out of these, 10 amino acids are in such a manner that they are not synthesized in the human system and are thus known as essential. They have to be supplied to the animal system from external sources. Proteins have been categorized based on some parameters. According to their solubility and physical properties they are categorized into: (1) Simple proteins (2) Conjugated proteins and (3) Derived proteins. Albumis: Serum albumin, egg albumin and lactalbumin. Globulins: Serum globulin, tissue globulin and vegetable globulin (that is, in seeds and nuts). Prolamines: Zein (obtained from maize), and gliadin (from wheat). Glutelins: Glutenin (obtained from wheat) and oryzenin (from rice). Scleroproteins: Keratin (from the hair) and fiborin (from the silk). Histones: Occur in the nucleic acids and haemoglobin. Protamines: Occur in the nucleic acids. Nucleoproteins: The prosthetic group is nucleic acid and the proteins are found out in the nucleus of cell. Glycoproteins: The non-protein portion is a carbohydrate or its derivative. This is found in 'egg-white'. Chromoproteins: These consists of a colored prosthetic group; particularly a pyrrole derivative. The colored prosthetic groups generally have a metal example: Fe, Cu, Mg and so on. Illustrations are chlorophyll and haemoglobin. Phosphoproteins: These encompass a phosphoric acid residue in some form (other than the nucleic acids or lipoproteins). Illustrations are casein (from milk) and vitelline (that is, from egg yolk). Lipoproteins: These encompass a lipid like lecithin, cephalin and so on as prospthetic group. 3) Derived proteins: These are the degradation products, corresponding to different phases, in the hydrolysis of simple or conjugated proteins through acid, alkali and enzymes. The other categorization of proteins into (A) Globular and (B) fibrous proteins is basically dependent on their functions and molecular shapes. A) Globular proteins: They are almost spherical in shape, soluble in water and in dilute acids, base and so on. Their significant function is maintenance and regulation of life- processes in the living organisms. All the enzymes, numerous hormones, antibodies, haemoglobin and so on are the illustrations of this class of proteins. B) Fibrous proteins. They encompass a thread like structure and are present in fibre like form. They are soluble in water, dilute acids and bases. They make the major structural material of animal tissues. For illustration, Keratin (that is, the protein present in skin, hair, nails and so on), myosin (that is, present in muscles), collagen and so on. 1) Apart from Chromoproteins, they are tasteless, colourless and odorless. Mostly they are amorphous however some are crystalline whenever pure. They don't encompass a sharp melting point. 2) Most of them are insoluble in alcohol and water however they dissolve in dilute acid and alkalis. A few proteins such as those present in skin and hair are, though, insoluble. 3) They encompass high molecular weight as the proteins molecules are extremely complex having thousands of atoms. 4) They are basically colloidal in nature. They are hydrophilic colloids that can't pass via vegetable or animal membrane. A few proteins make thick translucent sols with water that can set to gels on cooling. 5) Reversible precipitation: On addition of sodium chloride, ammonium sulphate, magnesium sulphate and a few alkaline earth-salts a few proteins are precipitated. The precipitate can be filtered and re-dissolved in water. This fact can be made use of in separation of several proteins. 6) Denaturation: Whenever heated or acted upon through reagents such as alcohols, heavy metal salts (HgCl2, CuSO4 and so on), picric acid or alkaline earth-salts, proteins are coagulated. Denaturation takes place most readily at the isoelectric point and is assumed to occur due to unfolding of the proteins molecule. Throughout Denaturation the secondary and tertiary structure unfolds however the primary structure remains intact. There is loss of biological activity and change in the physical properties throughout Denaturation however the chemical reactivity increases because of opening up of different functional groups. Denaturation is usually irreversible however there are numerous illustrations of reversible nature when it is known as renaturation. Gentle treatment of protein by urea or slow cooling assists in the procedure of renaturation. 7) Isoelectric point: Each and every protein consists of a characteristic isoelectric point at which its ionization and solubility is minimum. This property is made use of in the isolation and recognition of proteins through electrophoretic methods. 1) They are amphoteric nature: As proteins have free -NH2 and -COOH groups they react by both, the acidic and basic substances. 2) Hydrolysis: Proteins are hydrolyzed through dilute acids and alkalis or via enzymes. The products of hydrolysis are proteoses; peptones, polypeptides, simple peptides and α-amino acids. 3) Oxidation: The oxidation of proteins takes place via burning or decay. The products, based on the conditions of oxidation, are nitrogen, amines and carbon dioxide. The animal body throughout decay suffers bacterial oxidation generating all these products and the offensive smell is because of the different amines, cyanides and so on produced. Such reactions serve as test for proteins. The whole test might not be positive for each and every protein however majority of these must be positive for a protein. 1) Biuret test: On adding a dilute solution of copper tetraoxosulphate (VI) to alkaline solution of protein, a violet colour might be obtained. This test is on account of the probable formation of biuret (H2N.CONH.CONH2) as an intermediate. 2) Xantho-proteic test: If a protein solution is warmed by trioxonitrate (V) acid, a yellow colour is obtained. On making the reaction mixture alkaline by ammonia, the colour changes to orange. 3) Liebermann's test: Proteins having tryptophan on being boiled by concentrated hydrochloric acid followed through the addition of a few drops of sucrose solution provide violet colour. 4) Millon's test: If Millon's reagent (that is, mercurous and mercuric nitrate in HNO3) is added to a protein solution, a white precipitate that turns red on heating might be formed. This is due to the phenolic -OH group in the protein molecule. 5) Nitroprusside test: This test is applicable to some proteins having -SH group. They produce transient red colour on adding Nitroprusside solution. 6) Lead sulphide test: Proteins having -S-S- or -SH group whenever boiled by NaOH and lead acetate generate black precipitate of lead sulphide. 7) Molisch test: Protein solution is mixed by alcoholic solution of α-naphthol and concentrated H2SO4 is poured down all along the side of the test-tube. Proteins, having carbohydrate residue give violet colour at the junction of two liquids in the test-tube. The problem of structure of protein has been tackled at various levels. Isolating the proteins in pure state. Finding out the sub-units essential if results point out the presence of more than one C or N end groups. Hydrolyzing the proteins to get the amino acids which are recognized and estimated quantitatively. Finding out the molecular weight through amino acid percentage composition and physical processes. Finding out the series of amino acids by carrying out C-terminal and N-terminal analysis. 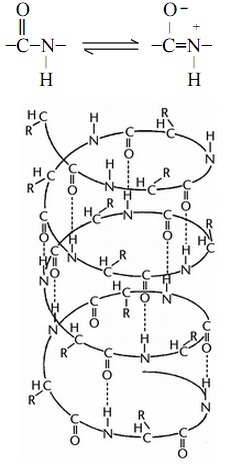 This step deals by the arrangement of the peptide chains in space to make coils, sheet and other structures that are held altogether via hydrogen bond, electrostatic forces and inter and intramolecular forces. The hydrogen bonds are made up between the carboxylic oxygen and hydrogen of -NH group. The force of electrostatic attraction or repulsion as well operates between the charged polar groups. To this is the added influence of the inter and intramolecular bonds similar to the disulphide bond. The α-helix structure is generally an acceptably structure. In this structure the hydrogen bond takes place between different -CO and - NH group of the similar chain that holds helix. Stereo chemical study exhibits that a helix having 3.7 residues per turn is the most stable. Hydrogen bonding exists among the -CO group of one residue and -NH group of the fourth residue in the helix. The stability of α-helical structure is as well due to the resonance between the -NH and -CO groups in the peptide chain. The coiling or folding of long peptide chains give mount to a (3-D) three dimensional structure that is termed as the tertiary structure. It comprises hydrogen, ionic inter and intra molecular bonds. Hydrophobic bonds are given mount to through the alkyl side chains of the amino acid that is hydrophobic in character. The polar group with high affinity for water (that is, hydrophilic) tends to take positions on the surface of the globular proteins. This occurs from the association of different similar or different sub-units. Each and every sub-unit has its primary, secondary and tertiary structures. 1) They are required as food for animals. 2) Proteins such as haemoglobin and different peptides are necessary for the system of human being. 3) Different essential enzymes in the human system and in nature are proteins. 4) Most of the anti-viral vaccines are protein in denatured form. 5) Different amino acids have been acquired from proteins. 6) Wool and natural silk are proteins. 7) Different helpful substances such as glue, casein and gelatine are proteins.